For some, this is just a time to unwind, however especially for ecommerce businesses the fun is just getting started. At Layershift, we’ve got you covered throughout the holiday season! You can decorate the tree, wrap (and unwrap!) gifts, watch your favourite Christmas TV special in peace, or if you’re feeling nostalgic, even have a Home Alone marathon with the family, as we’re taking care of all the rest. There is no need to check your computer every five minutes, or stay up all night during the first night of the Boxing Day (or week!) sales. We are here to make sure your servers are up and running. If you need extra resources to handle the rush period, keep in mind that our Cloud VPS servers feature Non-stop Upgrade™ technology so you can upgrade instantly via the My Layershift control panel without any downtime or service disruption. Our Jelastic PaaS automatically resizes in real-time to suit your website’s resource needs, all you need to do is set the scaling limit high enough for the thousands of incoming demands, as you will still only be charged for your actual usage! As always, we are here to take care of your servers 24/7, even on Christmas Day itself. We will continuously monitor and pro-actively resolve any issues that may come up, so you can rest knowing that your servers are in good hands. If you are experiencing problems, you can always reach out to our Technical Support team and they will take care of it for you! Christmas is a time you spend with family and friends, a time to kick back and relax. We would like to offer this opportunity to our hard working team as well, so they can return with renewed energy and ready to tackle the challenges of the upcoming year. For this reason, we will be working with a skeleton staff during the public holidays, so tickets will be prioritised by urgency level, non-urgent issues may be handled more slowly than usual. While we will always do our best to respond to all tickets in a timely manner, we appreciate your patience during this period. Our Sales and Billing teams will be operating as normal, during UK business hours (which excludes public holidays and weekends). Wishing you Happy Holidays and great success in 2016! 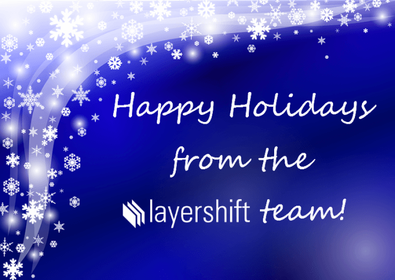 We at Layershift would like to thank you for having trusted us with your business for this year. For us it has been full of excitement and growth, and we hope we helped your business grow as well. We are looking forward to a sensational 2016 with you by our side! Enjoy your holidays and let us take care of the rest!